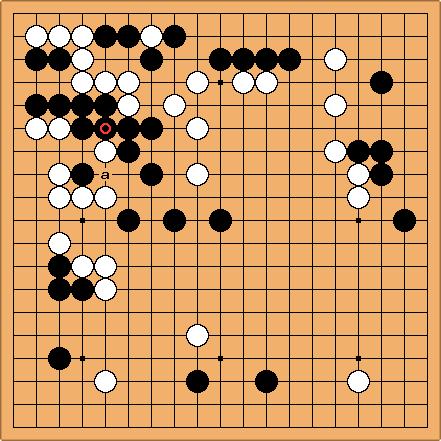 Move 69 in a match between Chitoku (Black) and Genjo (White) in April of 1812. The move, which prevented a cut that White could not yet make, was equivalent to filling in a dame. It is thought that Chitoku did this to ensure an eye at a and hint that Genjo should resign. Genjo resigned after move 155. This move is famous as the "ダメの妙手" (dame myoshu).